CSIRO Land and Water deployed eleven cosmic ray soil moisture sensors at ten locations across Australia (Figure 1) that will deliver data in near real time through a web service. These novel probes use cosmic rays originating from outer space to measure average soil moisture over an area of about 40 hectares to a depth up to 90 cm. This constitutes a quantum leap over conventional on-ground soil moisture sensing technology that can only measure soil moisture content within small volumes of soil. Figure 1: Location of the ten CosmOz monitoring sites. 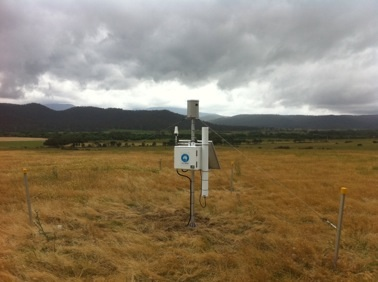 Figure 2: CosmOz system installed at Tullochgorum in Tasmania. Each system is comprised of a data logger, neutron detector, satellite telemetry, tipping bucket rain gauge and three surface moisture (TDR) probes. The system requires minimal maintenance and is powered by a solar charging system. The entire system is installed on a single mast (Figure 2). Data is logged and telemetered every 60 minutes. Ancillary data includes barometric pressure, component temperature and relative humidity, battery voltage and time. Data delivery occurs through a data dashboard that is accessible using the following link. The system measures fast neutrons that are produced from interactions of cosmic rays with the atmosphere and top few metres of soil. The intensity of these neutrons are moderated largely by water molecules in the soil. The number of neutrons counted over a period of time is inversely proportional to the amount of water in the soil. To estimate volumetric water content, each system is calibrated against soil samples that are collected from dry and wet moisture regimes using a standard protocol. 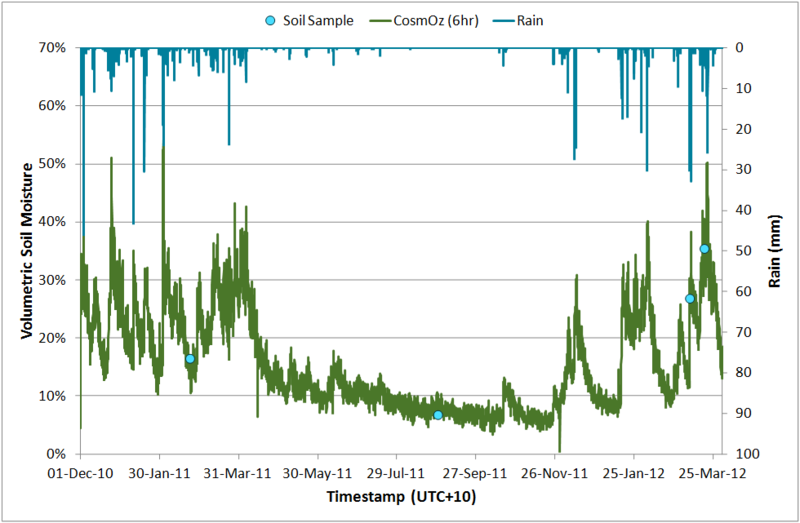 Soil moisture from the Weany Creek CosmOz detector is shown in Figure 3. From this figure it can be seen how sharp increases in soil moisture occur immediately following rainfall and how soil moisture slowly declines with time since the last rain. Applications of cosmic ray soil moisture probes include; site water balance, irrigation scheduling, calibration of satellite soil moisture estimates, soil water balance, weather model improvement (data/model fusion), catchment water balance modelling, flood forecasting and determination of large scale hydraulic properties. Figure 3: Preliminary CosmOz data from Virginia Park Cyclone Yasi occurred in February 2011.